Healthcare in Southeast Asia is a US$100 billion market. But there is a stunning diversity in the health systems of the ASEAN. Health spending per capita ranges from a mere US$20 in Myanmar to over US$3,000 in Singapore. Health outcomes, financing systems, and quality of provisions also differ widely across ASEAN. Growth in Asian healthcare is primarily driven by robust fundamentals such as a rapidly ageing population, rising middle-class and increasing incidence of chronic diseases. The region accounts for 10 per cent of the world’s population and 20 per cent of the world’s disease burden, yet commands only 3 per cent of global healthcare expenditure. Asian Development Bank has projected Asia’s elderly population to reach 923 million by 2050, making it the oldest region in the world. This implies more focus on healthcare needs of an ageing population. Existing and upcoming healthcare companies will have a large role to play in combating this challenge. It’s estimated that NCDs (which include cardiovascular diseases, cancer, diabetes and chronic respiratory disorders) claim 40 million lives every year, 17 million of whom are people under the age of 70 and 8.5 million of whom are in Asia. Establishment of the ASEAN Economic Community (AEC) in 2015 reduces business boundaries between ASEAN members and makes it easier for certain professionals to work in other ASEAN countries. Doctors and specifically, dentists are among the 7 professions that are granted labor movement within ASEAN. Technology will continue to have unprecedented impact on healthcare in terms of building the foundation blocks towards a connected home and healthcare ecosystem. Here are 9 top predictions for healthcare in 2017. With ecommerce being hyper-competitive and capital heavy, entrepreneurs have started to look beyond physical retail for new opportunities. Following a similar trajectory as the US and China, startups in Southeast Asia will gradually move into insurance, finance and healthcare. Only 3.9% of South East Asia’s economy accounts for the total public and private healthcare expenditure. This is giving rise to private investment into web/mobile based healthcare startups. Here is a look at the top 15 funded healthcare startups in South East Asia. With the governments encouraging alternative points of care, there is an influx of wearable health care devices and home monitoring devices. The data generated from these devices is immense and needs to be responsibly integrated into electronic medical records of patients. Ministry of Health, Government of Malaysia, has launched the Malaysian Health Data Warehouse (MyHDW) ― that utilises big data analytics for healthcare. It will synchronise patient data from public and private clinics and hospitals, including university hospitals and Armed Forces hospitals, data from the National Registration Department (NRD), the Department of Statistics, and other “health-related agencies”. 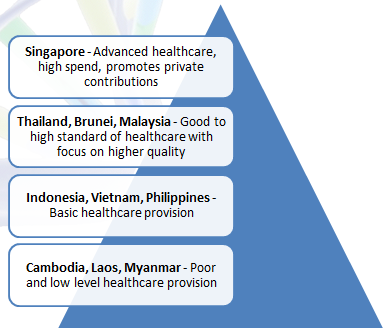 An overview of the state of healthcare across South East Asian countries.